The men are bent to their task, which is noisy, dusty and difficult. They wear face masks and ear protection, as carpenters are wont to do when they get down to the business of planing and sanding. They are engaged in an ancient art: building a mast from wood, much as it has been done since the wind first propelled ships. In today’s age of composite everything, this effort might seem silly, but if you think for a moment, it’s part of our heritage, part of who we were and who we’ve become. 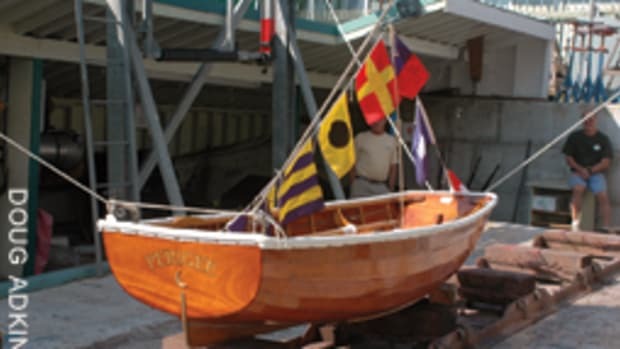 Sadly, sailing has lost most of its relevance for commerce, warfare and government-sponsored exploration, yet here I was, in a shed near the U.S. Navy base in Newport, Rhode Island, witnessing a new stick taking shape the old-fashioned way. Sure, the tools and techniques are more refined these days, and masts are hollow. Glues are no longer cooked from hide, and the means of protecting the wood are much better. But the essence of process and principle has not changed. 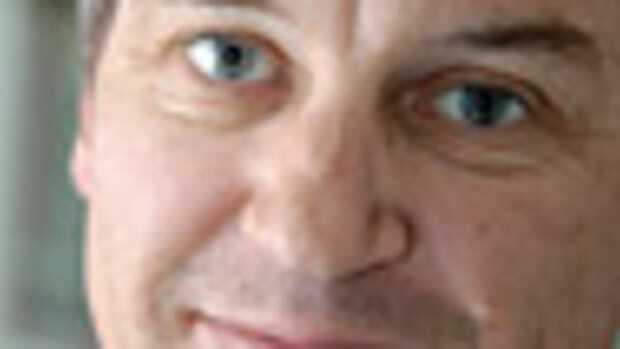 Neither has the material, which is carbon matter of the organic variety. This mast is made from Douglas fir and started out as a long octagon that was shaped by gluing eight staves together with bird’s mouth joints, then whittled to a round shape. Relatively speaking, this 43-foot spar is a simple one. It’s the mizzenmast for Starbound, a 72-footer that’s loosely based on Joshua Slocum’s Spray and was built in 1950 in Maine. 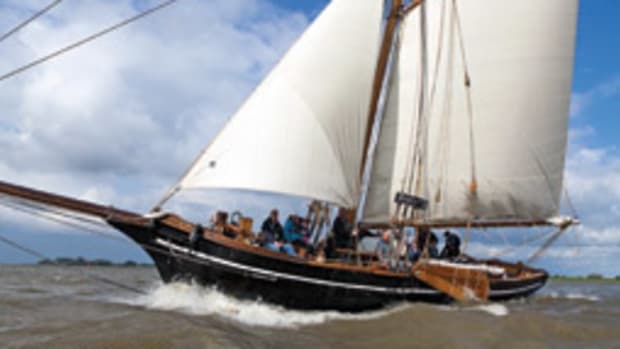 Starbound sailed around the world twice and is being restored to serve with SALTY, which stands for Seamanship and Leadership Training for Youths. 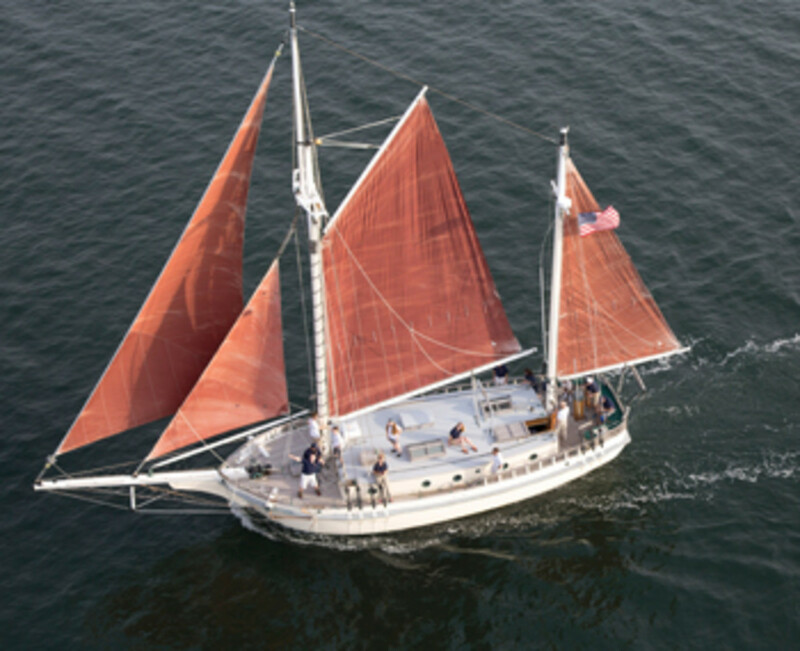 SALTY is a charitable organization based in Warwick, Rhode Island, that helps youth organizations introduce members to sailing and teach them about the region’s maritime heritage. 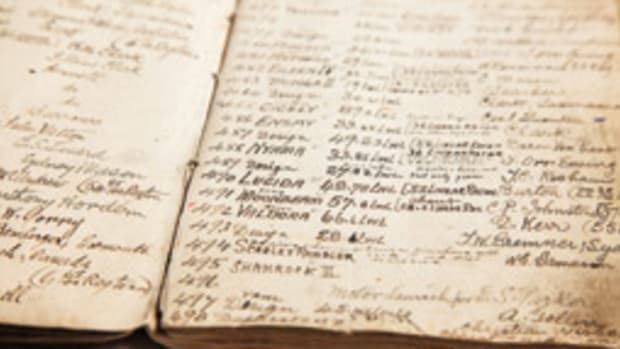 Preserving maritime heritage is also at the heart of the Northwest Maritime Center in Port Townsend, Washington. For some time, the Maritime Center has resided in a LEED-certified facility that is, among other things, home to a large, modern and well-lit boat shop where Douglas Jones and Robert D’Arcy toil in much the same way as the mizzen mates in Newport. 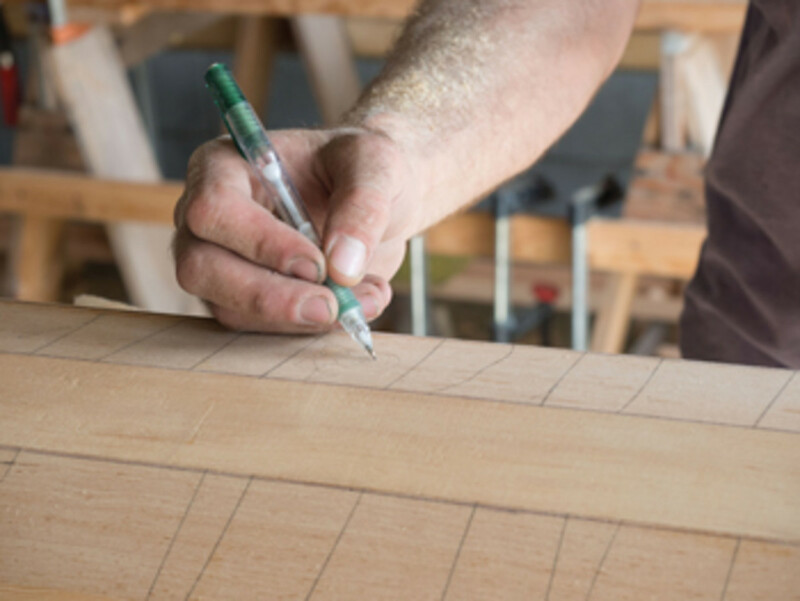 Jones is a shipwright and spar builder who moved to town from San Diego, and D’Arcy, who is from Providence, Rhode Island, learned the craft at Mystic Seaport in Connecticut. He is the captain and caretaker of the 1907 BB Crowninshield schooner Martha, the town’s signature vessel, which is docked outside the Maritime Center. Jones and D’Arcy landed the job of building a new mast for the 63-foot cutter Orient, a Sparkman & Stephens design launched in 1938 in Hong Kong. In the ’50s she gained fame as a formidable racing yacht on the West Coast under the ownership of Tim Mosely, an entrepreneur with a design and engineering background who came up with the world’s first two-speed winch that was chic, effective and reliable. It was the kind of kit that made others jealous. 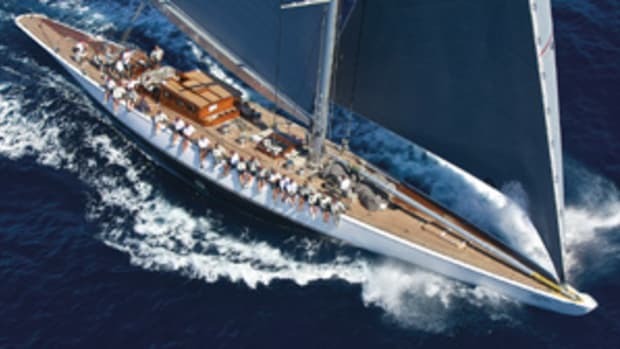 Among the admirers was Jim Michael, then owner of the 72-foot S&S yawl Baruna, one of Orient’s rivals on the racecourse. 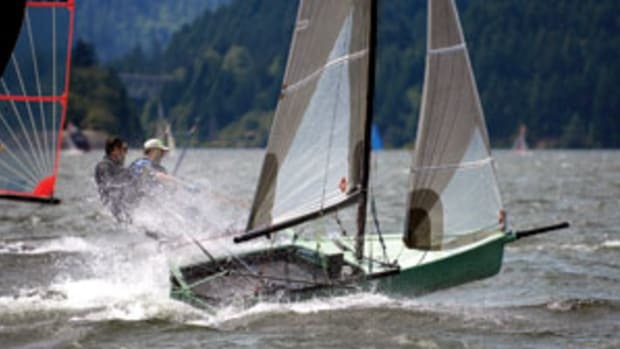 Mosely and Michael raced the heck out of their yachts but also became partners in a venture that carried a combination of their boats’ names, which penciled out to Barient, a fantasy word that became synonymous for winches that were so good they “sold like donuts at a police convention,” to quote a story in Latitude 38 magazine. Orient’s new stick is 81 feet, hollow and fashioned from Sitka spruce. It replaces a spar that was built in 1955 and had gone soft because of rot at the spreaders. It had also suffered from failing glue seams — after 60 years. A survey pretty much condemned the mast, so a new one was ordered. And that’s not all: The key objective is getting long boards without knots. “You want a tree that struggles, one that grows in a mature forest with 12 to 15 rings per inch,” Jones says. Luckily, he had bought a batch of old-growth Sitka spruce years ago for future jobs. This wood came in handy because it had time to air-dry. It was brought into the shop, where the moisture content was further reduced to around 10 percent by wrapping the boards in plastic tubes and blowing ambient air on them for a month. As with any job, it’s the tedious prep that makes the result sparkle. When I saw the project shortly before completion, Orient’s new spar was a piece of art, fusing function and aesthetics. It’s built from 12 pieces, so there are only two scarves to each stave. Orient’s owner keeps the boat in Southern California and has expressed a desire to stick with as much original hardware as possible, given the yacht’s pedigree as a testing platform for Barient winches. However, that does not mean there wasn’t room for improvement. Much of it was incremental and comes thanks to naval architect Greg Stewart at Nelson/Marek Yacht Design. The bag of tricks to accomplish this includes marginally bigger dimensions and less taper in select areas, plus the insertion of composite compression tubes. In Orient’s case, Stewart re-engineered the masthead with new hardware that simplifies operation and improves functionality. Such fittings have to be custom-cast in copper bronze, aluminum nickel bronze or silicon bronze, a process that is costly and time-consuming. That’s why Orient’s mast ran a couple of months behind schedule, though the owner has the means and the patience to wait for the job to be finished properly. Besides, given that a new mast might last five or six decades with proper maintenance and care, what difference does a couple of months make? “Boats on the West Coast that are in the water year-round are more exposed to weather, compared to yachts on the East Coast that get hauled out every year for winter, at which time the rig gets pulled for inspection and storage,” Stewart says. One yacht that made the switch from left coast to right is Santana, another S&S design, which actors Humphrey Bogart and Lauren Bacall once owned. Like Orient, she now has a female owner who is passionate about classic sailing yachts. Also like Orient, she has a new rig designed by Stewart, who had to look at photos because detailed plans were unavailable. 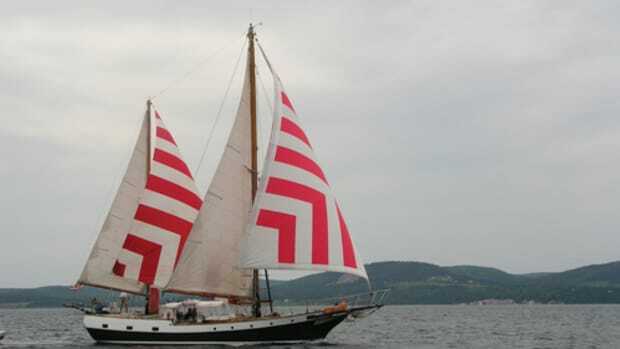 Santana was a schooner when she was launched in 1934, then changed to a yawl for rating reasons (and even sailed as a cutter intermittently) before being converted back to a schooner after she’d sunk at her berth in San Francisco in 1997. For a moment, the image of a sterile facility flashed before my eyes, with batteries of computer screens, CNC machines, vacuum bags and autoclave ovens. You know, like a place where 21st-century masts are built from synthetic carbon matter. How long will Flaherty and his crew be doing this kind of work? 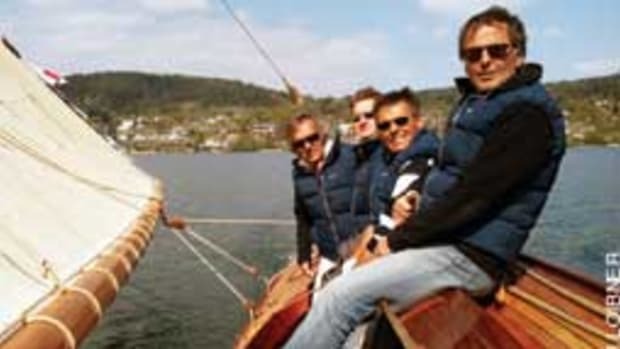 “As long as there are people who like classic yachts with wooden masts and can afford to own them, there will be guys like us,” he says, putting on his mask and firing up the electric plane.